Afton is a rather boring person in her opinion. She has long held a position as a hostess on a tourist airship. 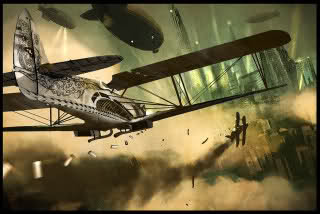 Every friend she has ever made works on that airship and she's had quite enough of them. After years of going back and forth between her boring job on the Liberty and her humble home in Canada, she had decided it's time to find herself. Afton is certain that this "self" she is destined to find is somewhere abroad. So on the last sunny day she can remember, she, dragging a small duffle bag and sporting her best hat, set off into the world. Welcome my good lady, so glad to make your acquaintance. Many of us here a re fairly new to steampunk, and the roleplaying world also. I do so hope you enjoy your time here. http://www.thesteampunkempire.com it has more steampunk stuff than you can poke a large fluffy duster at. I will be off to explore the Empire, now. Welcome Afton! I will have an RP academy for you soon. Hopefully it'll help you get back up with RP basics as well as introduce you to the world. And thank you. This forum was kinda fun to just slap together.